Much like today, Victorian women wanted to look good and there were many books with handy tips and tricks to help them. 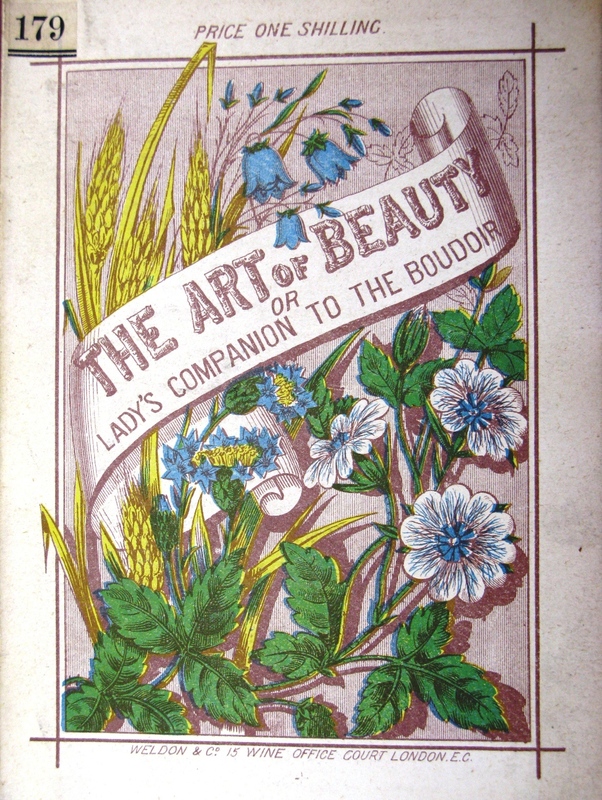 Rather than focusing on shop bought lotions and potions to achieve the ideal, many of these books contained recipes for making your own beauty treatments. Proper preparation was key. Most of the books advocate the use of good old soap and water but other options were available. Mixing potash (potassium carbonate), rosewater, brandy and lemon juice into water and then rinsing your face made for a reviving skin wash. A lotion for ‘imparting a soft and delicate appearance for the skin’ could be made by mixing mercury and emulsion of butter almonds – but as the book cautions, care should be taken not to add too much mercury! Wrinkles were as much a problem for Victorian women as they are today and many of the books contain sworn wrinkle busting recipes. Mixing onion juice, white lily, honey and white wax together and then applying as a night cream was a sure fire cure for pesky lines. Spots could also be cured by adding a little flour of sulphur to milk and then dabbing on the affected area. Due to the smell, people would then no longer come near enough to you to see that you had a spot! Greasy skin could be combated by rinsing the face with white wine – known for its purifying properties. Make up is generally discouraged for well-bred ladies. Even a Mr. Rimmel is quoted as saying that he ‘cannot conscientiously recommend paints for the face’! For those that chose to indulge, powder puffs made of swan feathers were recommended to apply a light layer to the face. Victorians used to kill five hundred swans a year purely to make these puffs so there was obviously a demand. A layer of glycerine should be applied to the face first to ensure a smooth application. Nails could be polished with beeswax and a chamois leather to gain a high shine and mixing small quantities of sulphur with the finest lard could restore greying hair. Although the Victorians may have had some strange ideas about beauty routines, most of the books conclude with the same remarks. The key to beauty is happiness, since it ‘gives colour to the cheek and a sparkle to the eye’, all for free!